On 6 February 2008, Gary Taubes spoke at the Stevens Institute of Technology about Big Fat Lies. In it he convincingly explains the problems with the conventional wisdom that obesity is caused by excess calorie consumption and physical inactivity. Lustig’s treatment of this subject is also good, but despite watching both videos I had difficulty explaining it at the meetup (or maybe the idea so conflicts with our current cultural biases that it is rejected without thinking?). Perhaps this will clarify the situation: the body may choose to deposit a calorie as fat even if it is starving and malnourished (Taubes cites many examples of obese malnourished people). Likewise, the body may choose to “spend” its calories despite an excess from a large meal (there are thin people who can eat anything without gaining weight). There are profound physiological phenomena that affect the impact of a calorie. It is not as simple as “calorie in; calorie out”! Taubes concludes that “obesity is not a disorder of overeating, it is a disorder of excess fat” which he calls the lipophilia hypothesis. Apparently, it was widely accepted before world war II. He effectively “proves” (at least he convinced me) that fat deposition requires carbohydrates such as sugar through the mediation of insulin. In this video set, Dr. Richard Johnson argues that fructose increases uric acid (a fact corroborated by Luc Tappy as I mention below) which he claims mediates hypertension and cardiovascular disease. What I liked about his presentation is the rich history and stories about the twists and turns in the development of medical research. If sugar is bad, are artificial sweeteners any better? I have not thoroughly researched this issue, but in this video Dr. Rutledge’s argument seems basically sound. Namely, there do not seem to be any reports that “diet” foods are proven to help people lose weight. Rutledge points out that makers of such foods would advertise the fact if it were true. We can infer that artificial sweeteners do not lead to weight loss and better health. Moreover, Rutledge cites a study at Purdue that links Artificial Sweeteners To Weight Gain. So one should be wary of artificial sweeteners too. 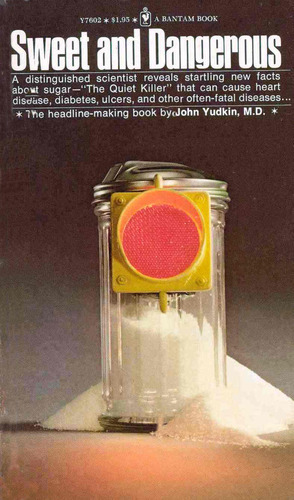 After reading Yudkin’s book and watching all these videos indicting sugar, I realized that I put myself in danger of suffering from conjunction bias (over-valuing arguments that are juxtaposed) and confirmation bias (seeking out only evidence that supports the sugar is toxic thesis). Most of us fall victim to these biases in our research … especially Internet research where our search engine can exacerbate the problem by “helpfully” finding related (read that as similarly biased) content. To avoid these biases and to aspire to a more comprehensively valid truth it is important to actively seek out alternative ideas to challenge and test our theories. Exerting some effort to disprove one’s working hypothesis can be very helpful. 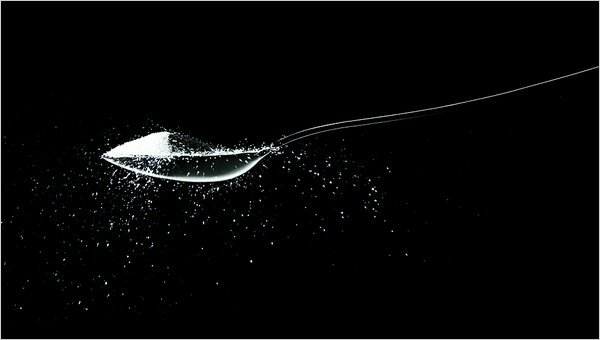 So I spent some time searching for articles that praise sugar’s benefits. Of course, I learned that the sugar industry strongly argues that sugar is healthy. And from time-to-time some nutritionists also argue that sugar is not dangerous (see, for example, this report). Most articles I reviewed advise that sugar consumption should be reduced with the possible exception of athletes, marathoners, and mountain climbers (who can benefit from carb loading). But very few accept the conclusions of Yudkin, Lustig, and Taubes. The sugar is toxic thesis is still at the frontier of scientific discussion. Taubes addressed the bias concern in his New York Times article by citing Luc Tappy’s research. Tappy is regarded as one of the foremost authorities on fructose biochemistry. Tappy and Kim-Anne Lê wrote a very technical article on the “Metabolic Effects of Fructose” which carefully and quite conservatively reviews the known effects of fructose. The article asserts that fructose increases fat (triglycerides) and uric acid in the blood. But the other effects that Taubes and Lustig refer to are, according to Tappy and Lê, less conclusively demonstrated. However, in some cases they cite substantial indirect evidence for these deleterious effects. Although the hypothesis that sugar is a chronic toxin is not proven “beyond a shadow of doubt”, the case has strengthened considerably since I first read Yudkin’s book about 30 years ago. As with all hypotheses, it is wise to remain skeptical. Truth requires the sustained accumulation of more and more corroboratory data. Nonetheless, it would be wise to reduce one’s fructose and sugar consumption in case more of the allegations are confirmed. I was with Dr. Lad today and he discussed sugar! All around great job, CJ, research, writing! Do you guys have an e-reader? If so, check out my illustrated memoir, Lunch with Fellini, Dinner with Fidel at Amazon. Good research! Actually i’m living proof of the toxicity of sugar and artificial sweeteners. As a long-term diabetes case, i’ve been successful with completely eliminating sugar, and failed miserably when i started to compromise on that in 2000. Lost a lot of weight, to an unhealthy status, and eventually started manifesting serious neuropathy. That became a springboard for chronic foot infections, resulting in a partial amputation and a lot more fighting. Definitely fructose is worse than any other form! As for artificial sweeteners, i used to do a lot of asparatme. Had some terrible eye problems which cleared up after i stopped using it. That substance has destroyed many good careers, especially for pilots. Thanks for this. I note you did not reference “Sugar Blues” which hugely impacted the hippie/organic gardening/vegetarian scene in California in the 1970’s. Reading that little book changed my eating habits immediately and permanently. I found the following about the book on Wikipedia. “Sugar Blues is a book by William Dufty that was released in 1975 and became a commercial success. According to the publishers, over 1.6 million copies have been printed. In the book, Dufty makes the case that sugar is an addictive drug, that it is extremely harmful to the human body, and that the sugar industry conspires to keep Americans addicted to sugar.” Through my own investigations and dietary adventures, I am sure that the craving for sugar is largely the craving for good fat, as opposed to bad fat which often rides shotgun in the foods loaded with sugar. Thanks for this perceptive analysis of the current status of clinical findings on the toxicity of sugar. I don’t often run into this kind of balanced scrutiny on sugar toxicity, so it is refreshing. I am a low carb (anti-sugar) advocate, so don’t like to have to say this, but you are correct in your findings. I’ve believed the same thing, but didn’t want to shout it to the rooftops! That being said, I agree with the Gary Taubes interpretation of what has happened with the scientific dialogue and clinical trial results related to the impact of sugar and refined carbohydrates on our increasingly difficult battle with obesity and its negative impact on health. He provided this interpretation in his book, Good Calories Bad Calories, and maybe in the shorter follow-up book, Why We Get Fat. First of all, he asserts that clinical dietary studies are by nature difficult and expensive to conduct and also easily misinterpreted because there are so many variables (patient demographics, health, age, etc.) that can invalidate findings. We’ve come to rely, therefore on the experts who conduct these studies to be scrupulously balanced (which you’ve done) in interpreting their results. Unfortunately some scientists weren’t so scrupulous in the 70s and managed to label dietary fats as the cause for our obesity and heart disease problems. That has been, for the last several decades, a commonly held, but uproven, belief. It led to a decrease in dietary fat and a compensating increase in carbohydrates in our diet, because we had to get the calories from someplace. Along with that relative increase in carbohydrates our obesity rates rose, almost precisely in sync. So now, when the low carb and anti-sugar advocates push for decreasing carbs in our diet, the status quo officialdom (the American Heart Association and the American Diabetes Association for example) push back by simply saying that the “dietary fat causes obesity” view is the null hypothesis and to prove otherwise we have to provide long-term statistical evidence to reject that null hypothesis. As you are seeing, that’s difficult to do. So, in short, bad science put us in a bad spot. In terms of proof for why sugar and carbs are the problem behind obesity I would suggest reading Good Calories Bad Calories. The evidence Gary Taubes presents is anecdotal, but the cumulative weight of one study after another over hundreds of years and including populations and differing socio-economic groups from all over the world is inescapable. As an example of one type of study included in the book, every time sugar and refined carbohydrates have been introduced to native populations for the first time, obesity and health problems have surged. As a personal note, I’m on a low card diet. I have seen my metabolism change and improve, my weight drop, and my blood test results improve, just as Taubes and Lustig predicted. It is also the easiest diet I’ve ever used. I remain an unabashed low carb zealot. In this discussion of refined sugar I am reminded of the old maxim “The dose makes the poison.” That goes back to Paracelsus in the 1500’s. Seems to me that this is true about “white refined sugar”, etc. A little bit once in a while won’t hurt you, but given the substantial amounts of sugar that most of us consume on a daily basis over prolonged periods of time, it is both toxic and addictive and it is biologically disruptive. Personally, I have been a low sugar and low refined flour intake “zealot” since I was a kid of 9 or 10 back in 1943/44. That was World War II when sugar was rationed. I saw no reason to change after the war was over. I follow this regimen as best I can to this day, though it is very hard to follow if you eat much junk food. So, I avoid junk food, period. Everybody loves to eat sugar, salt, and saturated fat somewhat in that order. Great ideas, CJ, I hope you follow it further. I’ve been looking at diet for a while, as I grew up morbidly obese. I worked on my diet to severest extremes at times in my life, from Kushian Macrobiotics to high protein, sometimes no fructose, often with natural fructose… Now that I am a parent and have watched hundreds of kids eat more and worse than I ever did growing up, I know there’s much more to it. I tend more towards believing there are numerous factors influencing epidemic obesity, diet being one of the last factors. Activity being the first. I started reading the Weight Watcher’s books at ten, OA by 13, Kushi by 16… and the first things I noticed at any meeting was not the type of diet people succumbed to but their personal type and neuroses. There are personality types that match fat types. Several of them I feel are related to boundaries issues, fat becoming an exo-boundary, esp in victims of molestation, physical or psychological. Some aspects are not personal or identity-based at all, like thyroid and hormonal influences. How many times have you heard that thyroid is a fat people excuse for their bad behavior? Yet thyroid testing commonly done is totally inadequate to determine if the system is working. I think the topic deserves a volume of books at this time in the world, so I had better let the writing go now, or else my behind shall look like the seat of my chair. And I think the point with all this sugar effects analysis is to avoid that. Nicely written, CJ, carry on.